Passionate, loving, loyal, kind. Those Hopkins people whose lives were cut tragically short on September 11 were all that and more. Much, much more. 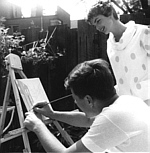 Rarely seen photos of Jack and Jackie Kennedy--treasures pulled from the Peabody Institute archives--capture the newlyweds at home, at work, and at play. "Hunger for a Glorious Future!" Dramatically cutting back on what you eat appears to slow the ravages of aging. But the drawbacks are no piece of cake, as our enterprising writer found out. Forget much of what you've learned about the Lost Colony at Roanoke, says anthropologist Lee Miller (MA '87). Her solution? A riveting tale of sabotage and intrigue. Hopkins scientists who work at fathoming the stuff of life find DNA to be incredibly complex, frequently amazing, and out-and-out strange. 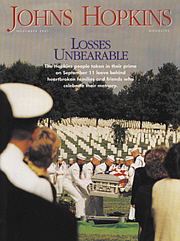 Cover photography by Sam Kittner, of the September 29 funeral of APL supervisor Ron Vauk, a U.S. Naval reservist killed at the Pentagon on September 11.